Puna 1960. Will history repeat itself? Volcanoes spring predictable surprises. Ever since Puʻu ʻŌʻō began to inflate it was clear that a new break-out was brewing. The 61-G flow had been in decline for many months: the spectacular ocean entry had ceased some time ago, and the flows had withdrawn to within a few miles of the origin. That is typical for a reducing flow rate: the lava can only travel until it solidifies, and the lower the rate the sooner it becomes stuck. A lava tube can extend the flow but cannot save it. Why did the flow rate reduce? Either the input into the magma chamber had declined, or the outlet had become restricted. Why did the inflation suddenly start? Either the magma input went up, or the outlet had become even more restricted. HVO has reported that gas emissions did not increase during the inflation which argues against increasing input. However, there had been an increase in deep earthquakes in the region, from about August 2017. In either case, the system began to back up, and the lava started to accumulate in Kilauea itself. Its lava pond began to rise, and finally overflow on the floor of the crater. Inflation at Kilauea came long after the 61-G reduction, showing that the main problem was an obstruction downstream. The plot shows the extension of the Puʻu ʻŌʻō crater. It began expanding mid-March, stabilized (mostly) early April but a massive acceleration started mid-April. (This was also the time Kilauea started to respond.) Eventually it reached 20 centimeters, far in excess of anything seen in recent years. At the same time the crater floor was coming up. It was only a matter of time before something would give. A deflation at Kilauea lasting several days stabilised the system. However, this reversed on April 29 and the lava pond began to rise. 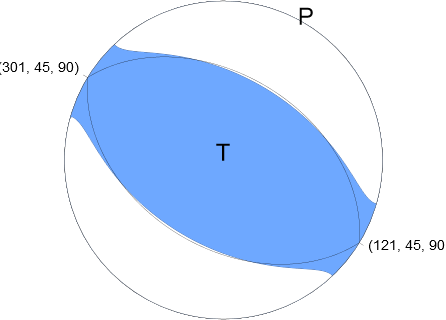 The failure began at 3pm local time on April 30 (1 am UT, May 1) with two brief, tiny tremors at Puʻu ʻŌʻō, picked up by the seismographs. Just after 3:30 the tremor restarted and now became continuous. The first earthquakes were picked up. Seismological hell now broke out, with tremor continuing for an hour, after which it slowly subsided. Midnight found things quiet, but now a new, fainter burst of tremor appeared, lasting six hours. Already at 4pm HVO noted that the crater floor was collapsing, indicating the magma had found a way out. But where? Now things got really interesting, for the earthquakes began to migrate east, which I had certainly not expected. The seismographs saw the activity coming and passing, amidst increasingly shallow swarms of earthquakes. Clearly the old rift zone to Puna was being re-activated. A second burst of earthquakes occurred at the coast, reaching M4.2, but these had no tremor associated with them. The steep edifice apparently was adjusting to the changing pressure. The earthquakes reached highway 130 at Kalapana and stopped for a few hours, but afterward resumed their march towards Puna. As of writing, they have reached near the Leilani estates. 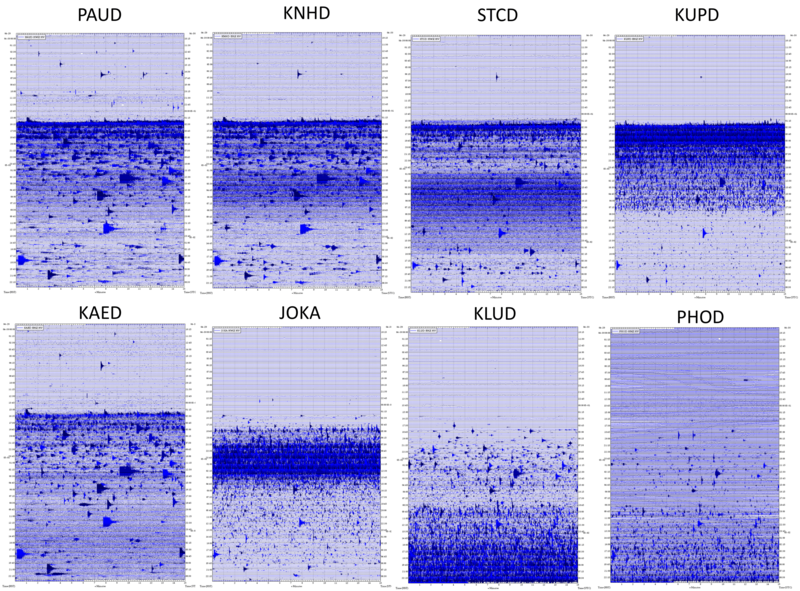 The plot below shows the various seismographs, more or less in order along the rift zone, for a 48-hour period. The start of the event is very clear, as is the progression as the activity moves east. KAED is the coastal location and does not show tremor other than that from the initial burst: the migration from the crater to PHOD on the eastern edge took about 20 hours. Clearly, the magma chamber had caused a dike to form. The progression is very similar to that of the Bardarbunga eruption, except things go faster. So far, the dike is some 15 kilometers long and extending at 1 km per hour. The logical conclusion of this event will be that the magma will reach the surface somewhere along the eastern rift. This is not very convenient as it brings lava into proximity to people. And even the famous black sand beach (which in my memory doubled up as a nudist beach) is now at risk. The 61G flow was cut-off by the collapse and will cease soon. The events are an imperfect repeat of the 1960 eruption which devastated parts of Puna. You can read about it on the HVO web site. The current dike seems to run closer to the coast which should help. 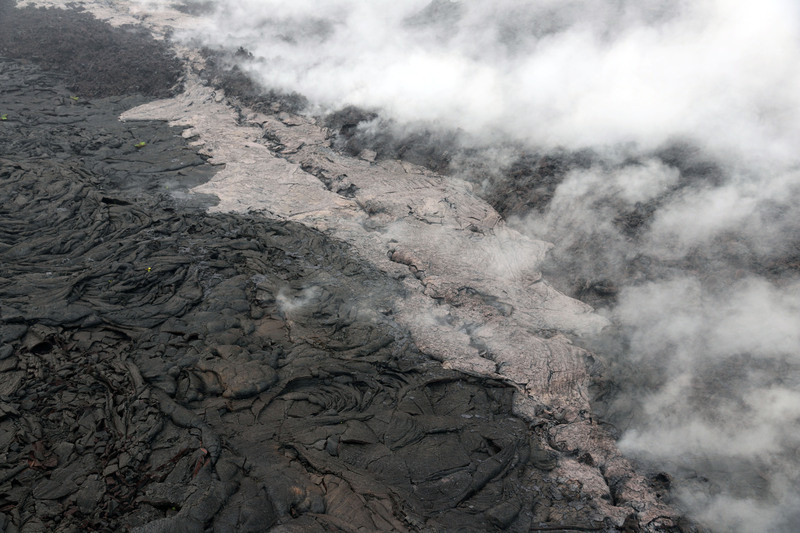 At the moment, the tilt on Puʻu ʻŌʻō is decreasing further, suggesting magma is draining out. Whether it has reached the surface yet is unclear: the weather is not conducive to investigations. 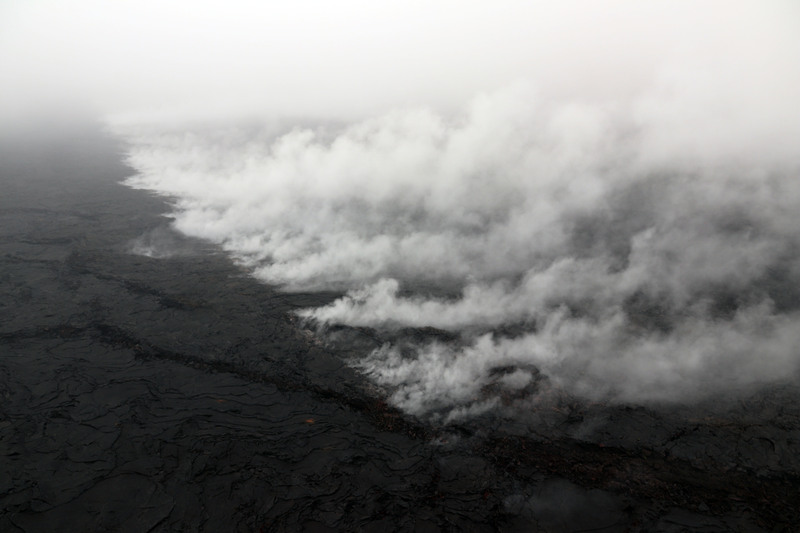 Kilauea has not yet responded to the events, which may be surprising giving its good magma connection to Puʻu ʻŌʻō. 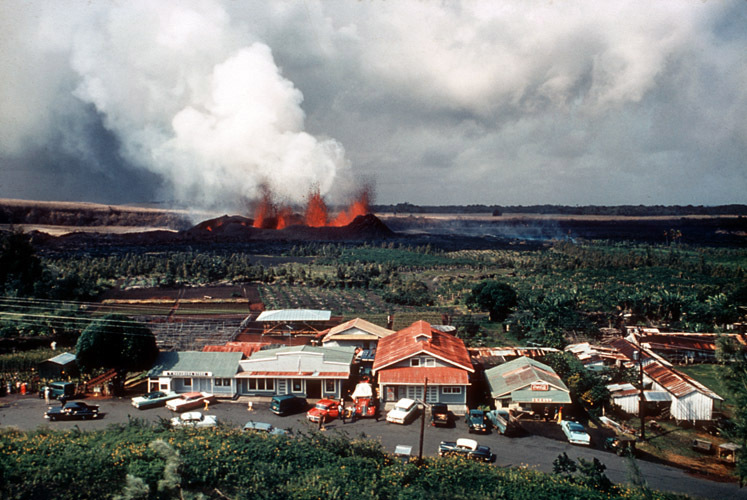 But in the 1960 eruption, it took four days after the start of the eruption before Kilauea itself began to deflate, so it is probably just a matter of time. There is one further interesting aspect to the events. The changes in the Kilauea system coincided with a stop in the inflation of Mauna Loa. Their magma chambers are not connected, but do the two systems affect each other? It will be interesting to find out. In the mean time, we wait and see. Weather is much better right now. We might see the collapsed crater in a few minutes. Already visible on the termal camera. Wow, looks almost alien! I wonder if Pu’u O’o is going to be abandoned again, a very major change considering activity has been concentrated there for 26 years! Interesting comment about similarity to Holuhraun, I suppose the stark contrast in “noise” level is due to the lower ERZ having last erupted about 50 years ago, compared to 217 in Iceland. I’m sure HVO are quite nervous at the moment, finger on the red button as so to speak, ready to raise the alert level to Warning at a moment’s notice! Seems like it’s going to be Kalapana 1990 all over again…. Web cams are up. Day light has returned. Video of collapse from 2011. From 2011, the crack that opened up might have looked like this. The eruption is ashy enough to have destroyed the rain runoffs that leads to the water tanks. That left the islanders without potable and drinkable water. The ash also damaged the harvest. Ambae can though do large eruptions, there are ample evidence of eruptions large enough to cause caldera formations due to subsidence. And even if the eruptions aren’t particularly explosive, being around a few cubic kilometres of lava is not that good an idea. Great article. Appreciated your detail of the events and likely results. I am intrigued by your last comment about the magma chambers of Kilauea and Mauna Loa. Is it a scientifically proven fact that the chambers are not connected? What, in your opinion, is the relationship? I find the light grey ash around the crack to be interesting. I am not one of the best on Hawaii and Pu’u O’o and it’s antics, but I do not recall ash looking like that around a Hawaiian vent. It will be interesting to see where an upcoming vent ends up. At this speed of propagation it could end up in the ocean. This event seems similar to 2011 s draining and collapse of Puu Oo, The fissure that recently opened south of Puu is 1 km long as the magma drained away from Puu Oos chamber. Thermal cams shows the pit floor completely collapsed. Its quite similar to 2011 s Kamoamoa fissure eruption. Not mouch lava have been erupted by the new fissure. Puu Oo s lava pond in a smaller pit is likley still there. This is very intresting! Nope the lava pond is very gone, the entire crater fell in like it did in 2011. Reference the last couple of articles on Levant geology. In the comments, I noted that the Zagros mountains are being pushed up by the colliding Arabian plate. Iran had a Mag 5.3 quake.. 11km WNW of Yasuj. And for a quick reference, this image at USGS is handy. 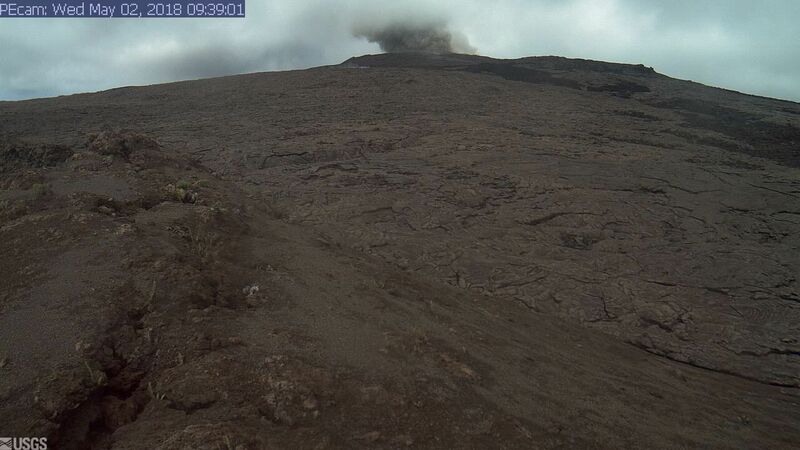 Looks like there was a explosion at Puʻu ʻŌʻō just now. please forgive if someone else has posted this… i’m old and slow…. Dunno about that. Fresh info is always welcome. If it’s a repeat, so be it. That just means it’s additional chance for someone to see and read the info. If it’s too much over alerting, a dragon will sweep it away. It is interesting that when this collapse happened, it appeared as though the initial activity was going to be a fissure eruption slightly upright of pu’u o’o, but just as that was starting it seems to have been cut off by the intrusion into the lower east rift. This was basically a failed repeat of the 1997 and 2011 eruptions, which got cut off by what might end up being the final act of this eruption. By final act, I mean that pu’u o’o is now no longer the lowest elevation that magma has a direct line to, so if the summit actually breaks into the pu’u o’o conduit in full force I would say that it likely to erupt in the lower rift rather than near pu’u o’o, which may have become functionally extinct and now only serve as a gas vent, much as the overlook crater was in its early years.. If the intrusion has actually got to the highway, then there is really no way this event can be considered small, but the amount of distance it has covered is very high already for the amount of magma involved, and it probably got that far by hijacking older magma bodies in the rift from 1977, 1961, 1960 and 1955. All of these magma bodies would be quite evolved by now so the new intrusion might actually erupt in a rather less peaceful manner than the lava flows that have happened until now. An eruption might be more strombolian in character initially, and consequently more closely resemble an eruption at etna rather than a typical hawaiian eruption, at least until the new magma catches up. Such an eruption would probably construct a cinder cone, and if the older magma has evolved then the volatile content of the magma could be concentrated, leading to some temporarily increased fireworks. At least this vent would be neither inaccessible or hard to see… In fact it could be a boon for the lava tourism guys. I am probably assuming a lot of things here that haven’t actually happened yet, but this dyke will remain a potential conduit for years, and the summit is very inflated at the moment so as soon as that finds an outlet, which is most likely down the east rift, it is going to pressurise the intrusion and cause an eruption, after which all bets are off. The start of an eruption would be quite intense as the weight of all the lava at higher elevation forces it out at high rate, after which it may or may not continue at a low rate like the other flows, but either way I think the chance of an eruption in this area is going to be very high for a while after the immediate events stop. HVO might lower the alert to avoid the ‘boy who cried wolf’ treatment but while there is still magma flowing into the rift there will still be an eruption, the overlook crater hasn’t overflowed again and there is no evidence that anything happened to the conduit uprift of pu’u o’o so it is safe to assume it still works. Is this page going to remain open for a while or is it better to post on the latest one (the one about Kyushu volcanoes)? I also want to point out that the line of earthquakes probably doesn’t trace out the dyke itself the same way it did in Iceland, the earthquakes here probably happen due to the south flank slipping and the dyke itself is filling in the space behind. This happened in 1983 too, though not as much because of the 1975 earthquake being a recent event then. The east rift is essentially aseismic up to pu’u o’o unless magma gets within a km of the surface, it is less ductile after that, but the residual heat from the eruptions in 1955 and 1960 are still there so the area is quite hot. The 1924 intrusion was very seismic because the rift had been the site of only one eruption in the previous 130 years and so there was less heat and more brittle rock. Looks like Puʻu ʻŌʻō now produces explosive (? A video would help) eruptions every few minutes to an hour. I wonder if it’s phreatic or caused by further collapses of the crater walls. It is probably both, the upper surface of the crater floor was probably relatively cold and waterlogged, and when the crater collapsed all that water has ended up in the hot crater floor and now it is probably causing steam explosions. The lava pond at the west end of the crater is very gone too, the crater is like the 2011 crater again – and unlike 2011 this might be permanent. I noticed that too, In 1960 halemaumau actually underwent a collapse that was visible (though most of that was probably because at the time it still had a partly molten lava lake from 8 years earlier that drained out), but the collapse only happened about 4 days after the eruption started so things might still have a bit to go. Ground cracks have started appearing in Leilani Estates subdivision… This means that magma is building up in that area, and eventually there could be an eruption near here. There is no steaming so there is no magma at very shallow depths but that might be because it is a recent change. At least this isn’t a sudden process, if an eruption happens it still could be some days/weeks away, however long it takes for the pressure in the dyke to exceed the strength of the surrounding rock (which probably isn’t that much if there are cracks everywhere). Im not a religious person, but it is rather interesting how 4 years ago a lava flow came within a literal stone throw of destroying a town in lower puna, and now an actual eruption in this same area is a very real possibility. Is Pele returning to finish what she almost started? I found it as a picture today on the HVO website, the picture wasnt there this morning, and combined with the size of the cracks it is indicative of a very recent development. My guess is that an eruption would start within a week, and possibly within the next day, if the 1955 and 1960 eruptions are any indication. It is unlikely that an eruption here would be really intense like the 1960 eruption (no 500+ meter tall lava fountains etc…) but the lava effusion rate could be significant, probably a lot higher than the lava flows at pu’u o’o before now. As far as I know the steaming isnt likely to happen unless the magma is near the surface where there is too much water to boil off quickly. If the intrusion goes down as far as Kapoho though then there could be significant magma-water interaction. The 1960 eruption was partly phreatomagmatic and Kapoho crater right next to it is a tuff cone. Given that there are cracks showing now though I dont think it is going any further down and will erupt in this area, eventually. Interestingly, the ground to the right of the cracks is dry, whereas it’s wet on the left side. This indicates some hot air escaping from the cracks, but it would not be a significant heat, just enough to speed up the drying of the road surface a bit. These are some videos of the previous eruptions in these areas. There was an even bigger eruption in 1840 but obviously neither HVO or portable working cameras existed then. Allegedly it was fast with a very high flow rate and happened with little warning – no large earthquakes or extensive fissures in the area of eruption. It also is notable in that it apparently featured significant lava fountaining but there is completely no cinder cones at all where the eruption happened (just south east of Pahoa not far from this current activity). There is/was a pretty big littoral cone where it flowed into the ocean though, it is called the Nanawale hills even though it is mostly gone now. The deformation at the summit vent has started taking the plunge now, it is descending rapidly at a steep angle and my guess is that it is responding to the activity down the rift. This is where it gets dangerous as an eruption is *very* likely if the summit drains out. The deformation page at has been updated with very nice plots showing the instant changes. The draining of Kilauea is accelerating as the pressure drop has worked its way back to the summit. It should be exponential at first, becoming linear once the outflow is at full capacity, and than taper off as the pressure equilibrates. Apologies for the quick-fire posts this week, the latest post was meant to be scheduled rather than published. Can we move all discussion to the new post. As mentioned above, and in case you have not noticed, the next post is up! Slightly ahead of the planned schedule but it is a beauty worth not waiting for!